A large cattle byre at Fashoda, with a bird ornament apex. In the foreground is cattle dung spread out to dry, probably for burning as a fuel. Several men can be seen sitting at the entrance to the byre, which has a surrounding post fence, a number of tethers hanging from a pole near the entrance. Manual catalogue entry (thermofax catalogue copy in folder '27-06 Seligman Slide Collection') - "V.g.29. Shilluk cattle kraal at Fashoda." Note on lantern slide ms ink - "V.g.29. 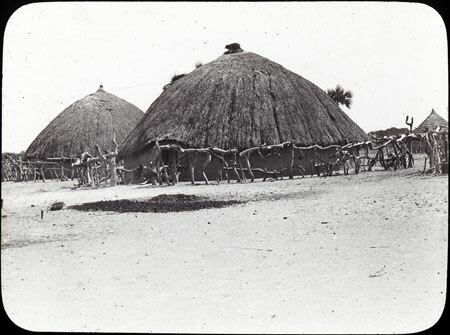 Shilluk cattle kraal at Fashoda. CGS. 276"
Morton, Chris. "Shilluk cattle kraal" Southern Sudan Project (in development). 03 Jan. 2006. Pitt Rivers Museum. <http://southernsudan.prm.ox.ac.uk/details/1967.26.233/>.